CNN's Jeff Koinange: "There's garbage everywhere." It looks like I'm in the middle of a war zone. I'm in the seventh ward in New Orleans. In the middle of a dry street is a speedboat, which indicates that at some point during this disaster, the water was so high that speedboat was maneuvering its way through these neighborhoods. Right now, the street is dry and resembles a disaster zone. There's garbage everywhere and it smells. A lot of these houses will be condemned because the water was so high. What's good is that a lot of medical personnel have been moved to the area, so any time anyone complains of any kind of irritation or symptoms, they're attended to immediately. That's fantastic to see. Walking around there are scenes like this everywhere: Stagnant water, garbage all over, mice running around, snakes and vermin. If this isn't taken care of in the coming days, there's going to be a major problem. We found a couple people still here, but for the most part this is a ghost town. This could easily have been a street from a rebel invasion. I'm in the famous French Market, usually teeming with all kinds of activity. This is a good microcosm of the city. Now, it is basically a ghost town, except for the occasional military vehicle that comes by. Crews are doing what they can to try to clean up this area, but floodwaters remain a huge problem. It could be some time before all the water has been pumped out of this city. Authorities say it could be three full months before drinking water is returned to the city as well. Some taps are back on, but the water coming out is untreated. Basically, it's coming straight from the Mississippi River into homes. Authorities are saying, by all means, don't use that water. 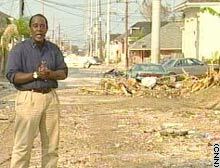 I don't like to cover hurricanes (never have, never will) especially one like Katrina. I was packed for a one-day trip to Memphis for a medical story and as breaking news usually unfolds, I was asked to go to the hurricane instead and had only two hours to prepare. It took me over two hours to pack my hurricane gear: raincoats, Gore-Tex everything, MREs, and even my Kevlar helmet from the last Gulf War. I was working with "CNN Presents" and we were told to follow the hurricane and find a family that was going back to their homes afterwards. Finding a hotel close to the Hurricane was nothing short of a miracle. We got to Meridian, Mississippi, the night before the storm. The next morning, we were the only cars driving towards the hurricane as it made landfall. Sounds crazy but that's what we do. Trees began falling on the roads ahead of us and power lines began to fall. We decided to turn around and find a hotel. We drove back about 20 miles as we passed dozens of cars abandoned on the side of the road. We found a hotel just hours before the eye passed over us. The hotel had no water, food, or electricity; something that we have to endure just like the people we cover. By the time the hurricane's eye passed over us, it was only a category two with 100-plus mph winds. The hotel was filled with people that lived in southern Mississippi and Louisiana -- even New Orleans. When the storm hit, everyone was very calm, including the children. We found a family that was going to try to go home the day after the hurricane. We followed them throughout the storm. The next day, we followed the family as they tried to find what was left of their homes in Slidell, Louisiana; one of the hardest hit areas. It got hot really fast. The temperatures soared to around 95. Pine trees littered the highways and the journey that should have taken us 45 minutes took 8 hours. We had to assist the evacuees with cutting and removing the giant pine trees blocking the interstate. When we finally got to Slidell, it was total devastation like I was used to seeing in a bad hurricane or bad tornado. We followed the family back into their homes and witnessed the anguish over destroyed properties and torn apart lives. Most people had good attitudes but I knew that wouldn't last for long. Ian Kandarian and I were assigned as a team to fly to New Orleans and meet up with the crews that had been chasing Katrina since it first hit the east coast of Florida. I flew into New Orleans around 9 a.m. on Sunday and headed to the Sheraton. I went with Miles O'Brien and his producer Dana Garrett along with the Chicago truck to Baton Rouge to do "American Morning" on Monday. We also wanted to get the truck out of the direct path of the storm to keep it safe. The plan was to set up at Louisiana State University and broadcast from there. We got hooked up with a dorm room with a bunch of beds in it since there were no hotel rooms left in Baton Rouge. After the show we attempted to drive back to New Orleans but by this time the police blocked off the city and only emergency vehicles were allowed through. Even playing the media card didn't work. We decided to drive to Slidell because there were reports of heavy damage there. Because of the traffic and a short layover at a truck stop, we didn't get there until midnight. Then things started getting bad. It was pitch black in the center part of town in Slidell because the power was out and there was no cell phone coverage. It was then that we discovered that since the Chicago truck was brand-spanking new, as was all of its equipment, the satellite phone had not been programmed and therefore didn't work. We had zero communication with the outside world and were unable to do live shots. Miles and Dana decided that they'd drive on to Biloxi since it was fairly certain that CNN had other crews there. Since Ian and I had been going for two days straight, we stayed in Slidell to get some sleep. At 5 a.m., it became clear that our first priority was gas and since we hadn't seen an open station since leaving the truck stop in Baton Rouge we started driving north. Jackson, Mississippi, was the first town we found with power. We sat in a gas line for about 3 hours and bought a couple of gas cans from a guy on the side of the road. We filled up and drove back to Slidell. While in Jackson, we had sporadic cell phone coverage so I contacted the National desk. They told us Miles and the truck were going back to Slidell. Long story short, having no way to communicate with other people in the area is a pain. We finally hooked up with them just in time to start setting up for "American Morning" on Wednesday.